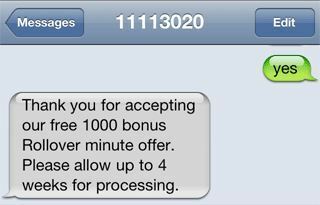 AT&T has been sending SMS text messages to its subscribers or customers with iPhone to offer 1,000 bonus rollover minutes, for free. The “gift” is certain to be a trick to prevent mass defection or carrier switching of AT&T iPhone users to Verizon, which launches CDMA version of iPhone for sales recently. You’re a valued AT&T customers. We’d like to add 1000 bonus Rollover minutes to the mobile number ending in XXXX. There’s NO cost or obligation to you. It’s our way of saying thank you. To have your minutes added, reply YES by 3/31/2011. Reply stop to end mktg msgs. Well, if you’re not receiving the promotion’s text message yet, or is not an AT&T users who is not an iPhone users (uses Android, Blackberry, Windows Phone, Symbian and other phone instead), it’s still possible to get the free 1000 bonus rollover minutes added to your account, as it appears that the offer may be valid for all AT&T customers. To get the 1000 free rollover minutes on AT&T mobile line for free (for AT&T customers who do no receive the offer SMS), just create a new text message (SMS), and then enter the 11113020 as the “To:” recipient. In the text (body), type YES (case insensitive thus Yes, or yes will work too). Thank you for accepting our free 1000 bonus Rollover minutes offer. Please allow up to 4 weeks for processing. 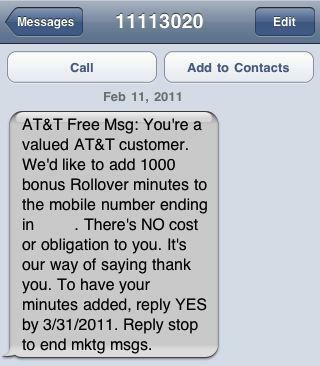 Check your AT&T account after a short while to see if the free Rollover minutes has been added. Offer ends on March 31st, 2011.